Our Super Wide™ rotary seals were designed for partitioning oil from drilling fluid in lubricant-overpressure types of equipment such as power swivels, where the lubricant pressure is intended to be slightly higher than the drilling fluid pressure. The dynamic lip of this new seal design is two times wider than our Extra Wide rotary seal product line, providing extra sacrificial material to resist abrasive wear. In previously reported 144 sfpm testing, seal performance was excellent with 15 to 200 psi lubricant overpressure and a drilling fluid environment. These test parameters were chosen to approximate the mud seal in normal lubricant-overpressure type power swivel operation. In more recent testing we subjected a PN 739-1-11 Type F Super Wide seal to 1,500 psi lubricant pressure with the large 0.020” radial extrusion gap clearance that is normally used in low lubricant overpressure conditions. The objective was to see if added strength provided by the additional lip width would allow the seal to survive at 1,500 psi despite the large extrusion gap clearance. The test was conducted with an ISO 68 viscosity grade lubricant. The environment side of the seal was open to air instead of being exposed to a drilling fluid because the primary objective of this test was to observe seal extrusion resistance. The 2.75” shaft was rotated at 200 rpm (144 sfpm) and the test temperature was maintained at approximately 162°F by moderate computer controlled through-shaft circulation. The average hydrodynamic pumping-related leak rate was 2.75 ml/hr per seal. Running torque was surprisingly low, ranging from 54 to 63 inch-pounds per seal. The test was terminated after 95 hours to inspect the condition of the used seals. As shown below, the condition was excellent, indicating proper lip surface lubrication and exhibiting only moderate protrusion at the seal portion exposed to the extrusion gap. Steps are being taken to manufacture and evaluate Super Wide seals with alternate wave forms, in order to explore the possibility of lubricating such a wide sealing interface with lower hydrodynamic pumping related leakage. Contact us for the latest information on this exciting new line of heavy-duty rotary shaft seals. 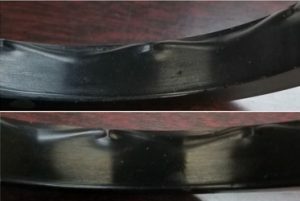 Condition of the front and rear test seals after 95 hours of operation at 1,500 psi. The dynamic lips were well-lubricated, and there was only moderate protrusion at the portions of the rotary seals that faced the 0.020” radial extrusion gap clearance.